Pedal steel guitarist Bobby Lee has been a professional musician here in Sonoma County since 1978. His first instrumental CD, Quasar Steel Guitar, was released in 1995. He was inducted into the European Steel Guitar Hall of Fame in 2010. 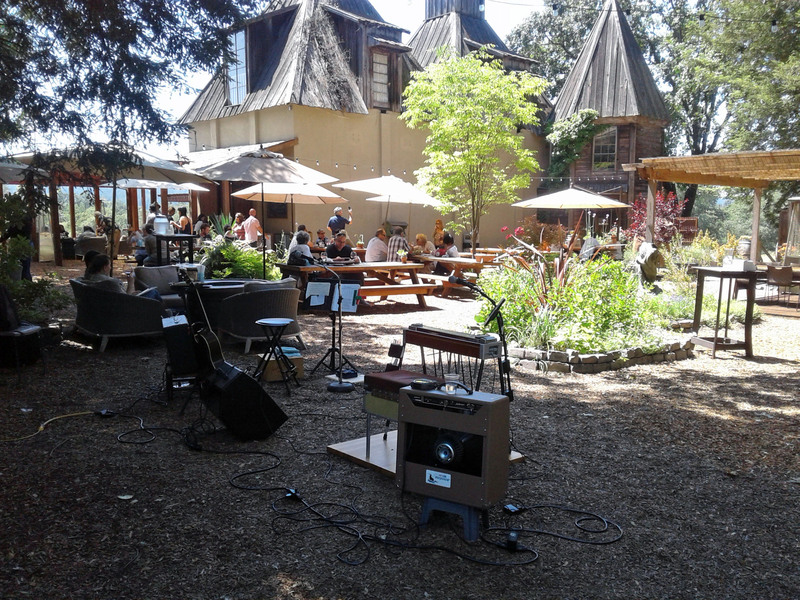 Our main venue this summer is Russian River Vineyards in Forestville, performing the “Sunday Brunch” set from 12:30 to 3:30 PM. This is a beautiful outdoor setting for a midday meal or wine tasting. We will be there on June 11, June 25, July 9, July 16 and July 30. We are also booked for the dinner set 5-8 PM on July 11. We have been performing at private events as well, sometimes adding a bass player and drummer for dancing. Contact us for bookings. A few years ago (2012) we recorded these songs live at Gaia’s Garden in Santa Rosa, CA. Come and enjoy our dinner set at the Russian River Vineyards Restaurant in Forestville on New Years Day, 5:30-8:30. On January 7, we’ll play as a quartet at Cloverdale Ale Co., 1st & Main in Cloverdale, 7-10 PM. The band will include Jerry Logan on bass and vocals, and Rick Cutler on drums. Expect a healthy dose of classic country. 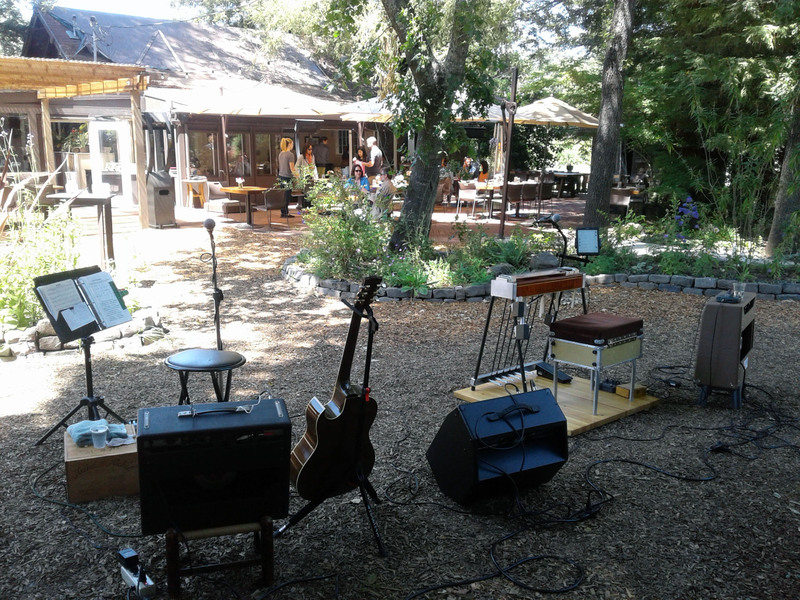 We often play the Sunday Brunch set (12:30-3:30 PM) at Russian Rivers Vineyards Restaurant. Upcoming Sunday Brunch dates are January 22, February 12, March 5 and March 12. We’ll also be there on Valentine’s Day (5:30-8:30). Call (707) 887-3344 for reservations. We’ve added some more dates at Russian River Vineyards: April 9, 23, 30 and May 14, 28. Moving into spring, we perform on the outdoor patio. Such a beautiful setting for wine tasting or a leisurely Sunday brunch! This video of Buddy Emmons' classic steel guitar instrumental "Blue Jade" was recorded at Russian River Vineyards on July 31, 2016. It’s also available for digital download and streaming at b0blee.Bandcamp.com. Once again, we’re playing a free Farm Tours event at Redwood Hill Farm near Forestville, on Sunday, June 8 from 11 AM to 3 PM. Bring the kids for a fun tour of a goat farm and some good western swing music. This is the last Redwood Hill tour of the season. Also this month, we’ll be returning to Gaia’s Garden in Santa Rosa for some countrified dinner jazz on Saturday, June 28, 7-9 PM. Wine Country Swing will accompany country entertainer Hank Floyd at Hudson St Wineries in Healdsburg on Saturday, May 10 from 11 AM to 3:30 PM. That’s not continuous music – we will play 3 sets – but there will be an outstanding display of model trains to keep you entertained in between, and of course plenty of fine wine. We’ll also be playing on Mother’s Day, May 11, at Redwood Hill Farm, from 11 AM to 3 PM. Redwood Hill is a goat farm and creamery, and this Farm Trails event is fun for all ages. 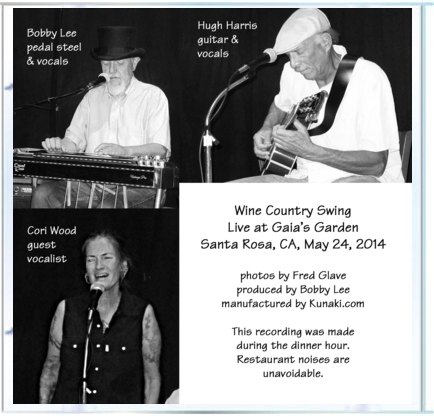 On Saturday, May 24, we’ll be playing a couple of dinner concert sets at Gaia’s Garden on Mendocino Ave, in Santa Rosa. There’s a $5 minimum (no cover). Music starts at 7 PM, and dinner is served until 9. Rounding out the month, we’ll be at Vino di Amore in Cloverdale on Friday, May 30, from 8:30 to 11 PM. Known as “Cloverdale’s living room”, this comfortable wine bar is just half a block from the town plaza where Friday Night Live entertainment will be winding down. Show up early to fill your bag with veggies from the weekly Farmers Market happening outside. 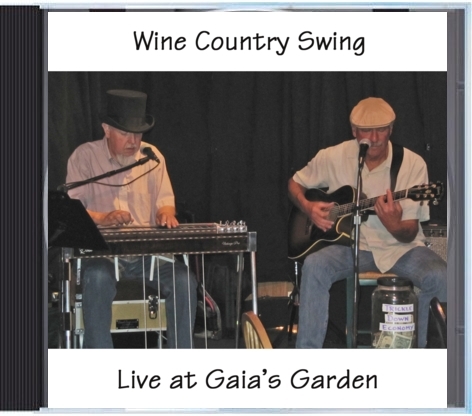 These songs were recorded live at Gaia’s Garden in Santa Rosa on March 15, 2012. This is the last of our DeLorimer Winery video clips from April 30, 2010. 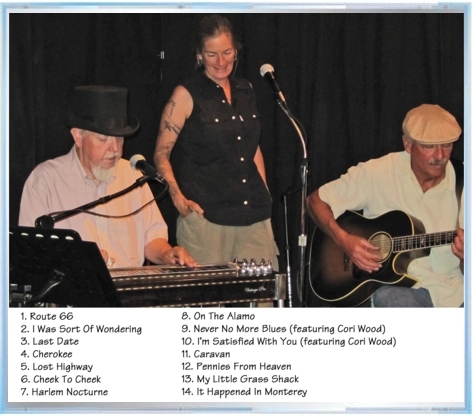 Includes portions of Remington Ride, Blues For Dixie, Streets of Baltimore, Waiting For a Train to Steel, and Rosetta. Hugh Harris (guitar, vocal) and Bobby Lee (pedal steel, vocal). Sorry again about the wind noise.